SIZE: 4-6 feet, up to 1500 grams. LIFESPAN: 15-20 years. Longer if kept well and supplied with vitamins. TYPE OF SETUPS: King Snakes can be housed in glass/acrylic tanks or tubs. Most people use tanks for display, but breeders use tubs for large collections. A 20 gallon tank is enough to house an average sized adult but if your snake is large, then a bigger tank should be used. THE TERRARIUM: In the terrarium you will need a few different things. You should have substrate, hides, a water bowl, and a heating device. I will discuss each one in detail. Substrate- Substrate can include Newspaper, Paper Towels, Eco Earth, Aspen Bedding, etc. A lot of people prefer substrates in which their snake can burrow into. Aspen Bedding and Eco Earth are great for this. Remember though, the substrates need to be kept dry at all times. If the substrate gets wet, there is a chance that a snake can get respiratory infection. Paper towels and newspaper do not let your snake burrow but they are an option as they are much easier to replace and cheaper. There are many other snake based substrates out there that you could use. 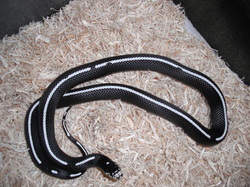 Hides- A King Snake should be provided with at least 2 hides. One on the warm side and one on the cool side. A humid hide is not necessary unless the snake is shedding. Remember you need to make sure the humidity is low. Hides should be small enough to make the snake feel secure. A climbing branch can also be used but it is optional. Water- Water is important to your snake. A water bowl should be provided at all times. King snakes often soak themselves in the bowl. The water bowl should be big enough for the snake to curl up in, but not to big where it raises the humidity of the tank drastically. Heating- Your King Snakes will require a heating device. These sources can be Under Tank Heaters (UTH), Lamps, Ceramic Heaters, Heat Tape or another Reptile heating source. DO NOT USE HOT ROCKS. These rocks get way to hot and will quickly burn your snake. UTH's are one of the best heaters. They go under the tanks and don't use a lot of watts of electricity. Heat lamps are also good but they use a lot of watts of electricity. Ceramic heaters are shaped like a corkscrew and they give off heat but not light. Heat Tape must be controlled on a thermostat because it gets very hot. It is recommended that all of your heaters should be controlled by a thermostat. TEMPERATURE: Making sure temperatures are right is important. The warm side, the side with the heating device, should be kept between 85 and 92 degrees but can get up to 95. The cool side is usually room temperature and should be kept between 75 and 80. FEEDING: Most Kings will live on a diet of rodents their whole life. Hatchlings should be fed a pinky once a week. After that just change the size of the rodents as it grows. A general rule of thumb is you shouldn't feed a rodent that's width is more than 1 1/2 times the width of the snakes widest point. Sub adults should be fed 1 time every 7-10 days and an adult can be fed every 2 weeks.